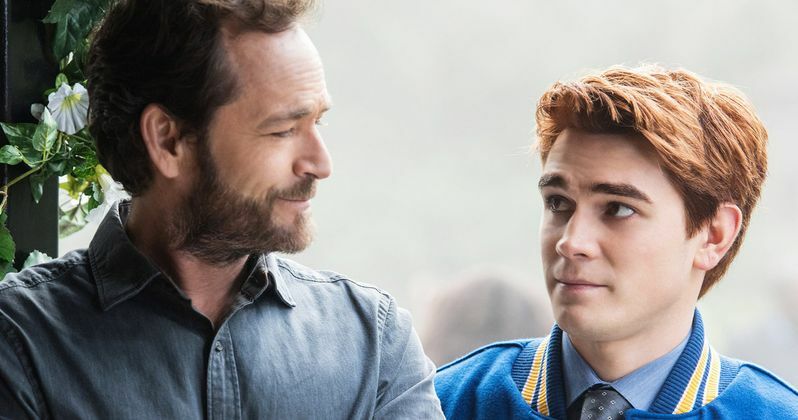 Riverdale producers shut down today's production on Season 3 following the news of star Luke Perry's death. Earlier today, it was reported Perry had died after suffering a massive stroke last week. The actor had been playing a recurring role on The CW's popular teen drama series as Archie's father, Fred Andrews. How the series will handle the character following the actor's death remains to be seen, but for now, the cast and crew is taking a break from filming to pay their respects. Additionally, showrunner Roberto Aguirre-Sacasa and producers Greg Berlanti, Sarah Schechter, and Jon Goldwater issued a joint statement offering their thoughts on Perry's shocking and saddening death. On Feb. 27, Luke Perry was hospitalized after reportedly suffering from a severe stroke. He was placed into a medically induced coma, and unfortunately never woke up. Under observation for about five days, Perry passed away surrounded by many members of his family at the age of 52. Among those with Perry during his final moments include children Jack and Sophie, fiancé Wendy Madison Bauer, ex-wife Minnie Sharp, mother and step-father Ann and Steve Bennett, sister Amy Coder, brother Tom Perry, and other friends and family members. According to a statement from Perry's rep, the family appreciates the "outpouring of support and prayers that have been extended to Luke from around the world," and they are requesting privacy in this difficult time. After appearing in bit parts on soap operas, Perry became a bona fide star when he was cast as Dylan McKay on Beverly Hills, 90210. This instantly turned him into a teen heartthrob, and there's no telling how many bedroom walls were adorned with posters of Perry in the '90s. He had found work in feature movies as well, which included roles in the original Buffy the Vampire Slayer movie and Terminal Bliss. He'd later take on more challenging roles, which included playing an imprisoned televangelist on the HBO prison drama Oz and post-apocalyptic wasteland survivor in the sci-fi series Jeremiah. Perry had done plenty of voiceover roles in his career as well, which included playing himself on both The Simpsons and Johnny Bravo. Perry's star was revitalized once again when he snagged a role on The CW's Riverdale. As a recurring role, Perry had been playing Fred Andrews regularly all the way up until his death. The news has obviously left Perry's colleagues on the series just as shocked and saddened as the rest of us. Perry's Riverdale co-star Molly Ringwald, who plays his character Fred's ex-wife Mary Andrews, has also expressed her sadness about the news on Twitter. "My heart is broken," Ringwald says on Twitter. "I will miss you so much Luke Perry. Sending all my love to your family." It's not clear when Season 3 of Riverdale will resume production, or how the series will handle losing Perry. The series may have lost a great character, while in reality, we're losing a truly wonderful person. We offer our condolences to the family, friends, and fans of Perry, and may he rest in peace. This information come to us from Deadline.